Proud Meghan Markle will have both her parents at her wedding to Prince Harry later this month - and the divorced couple will meet the Queen days before the ceremony, it can be revealed. Yoga teacher Doria Ragland and reclusive former Hollywood lighting director Thomas Markle will travel to the UK from the US in the week before the May 19 ceremony at Windsor Castle. 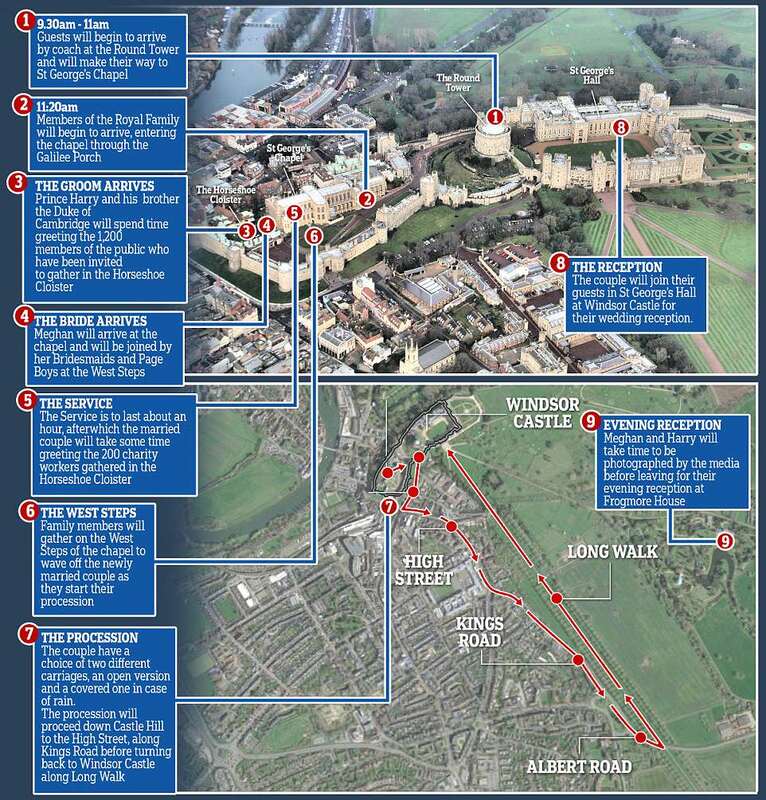 In a major departure from tradition, Doria will accompany her daughter by car to St George's Chapel, where Thomas Markle will meet his daughter to walk her down the aisle. 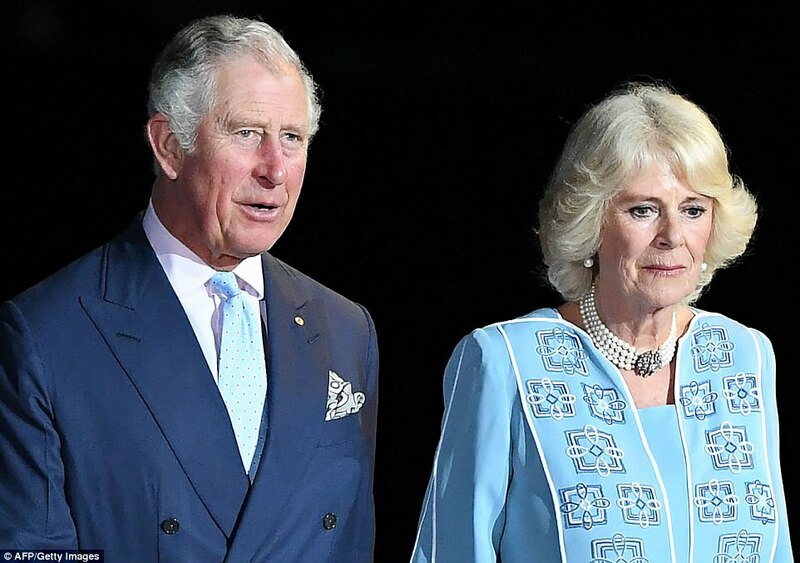 The divorced couple will be introduced to all senior members of the Royal Family including the monarch, Prince Philip, Prince Charles, the Duchess of Cornwall and the Duke and Duchess of Cambridge in advance of the big day. Astonishingly, it was also confirmed today that Prince Harry still hasn't met his fiancée's father - and won't until he flies over for the wedding. The palace said the Queen, Charles and William would all be involved in the wedding - but it has emerged that 96-year-old Prince Philip could miss the event as he continues to recover from his hip operation on April 4, with an aide simply saying that they 'very much hope' he will attend. The page boys and flower girls at the ceremony are thought to include Prince William and Kate's children Prince George and Princess Charlotte.In a statement today, a Kensington Palace spokesman said: 'The first thing I would like to share is that Prince Harry and Ms. Markle are very much looking forward to welcoming Ms. Markle's parents to Windsor for the wedding. 'Mr Thomas Markle and Ms Doria Ragland will be arriving in the UK in the week of the wedding, allowing time for Prince Harry's family, including The Queen, The Duke of Edinburgh, The Prince of Wales, The Duchess of Cornwall, and The Duke and Duchess of Cambridge, to spend time with them before the big day. 'Both of the bride's parents will have important roles in the wedding. On the morning of the wedding, Ms Ragland will travel with Ms Markle by car to Windsor Castle. Similarly, Prince Harry has made sure that his late mother's family will play a significant part in proceedings as a way of 'celebrating the memory' of Diana, Princess of Wales. All three of Princess Diana's siblings – Earl Spencer, Lady Jane Fellowes and Lady Sarah McCorquodale will be present with their families – and Lady Jane will give a reading during the service. The couple will spend, as according to tradition, the night before their wedding apart. There will be no American-style maid of honour and all of the couple's page boys and bridesmaids – who are expected to include Prince George and Princess Charlotte – will be children. 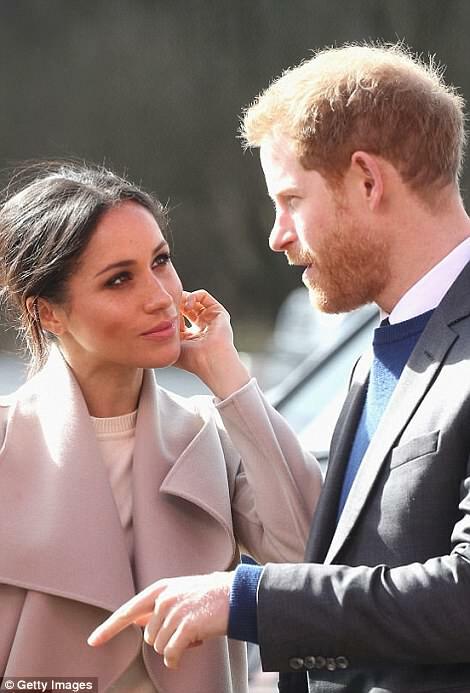 The couple will not go on honeymoon straight away – and will, remarkably, undertake their first public engagement as man and wife just days after the ceremony. The couple's guests will arrive at St George's Chapel between 9.30am and 11am on May 19. Guests will be arriving at the Round Tower by coach and will be seen walking to the South Door of St George's Chapel. Members of The Royal Family will begin to arrive from 11.20am, and enter St George's Chapel via the Galilee Porch. Some will be on foot, and others will arrive by car. 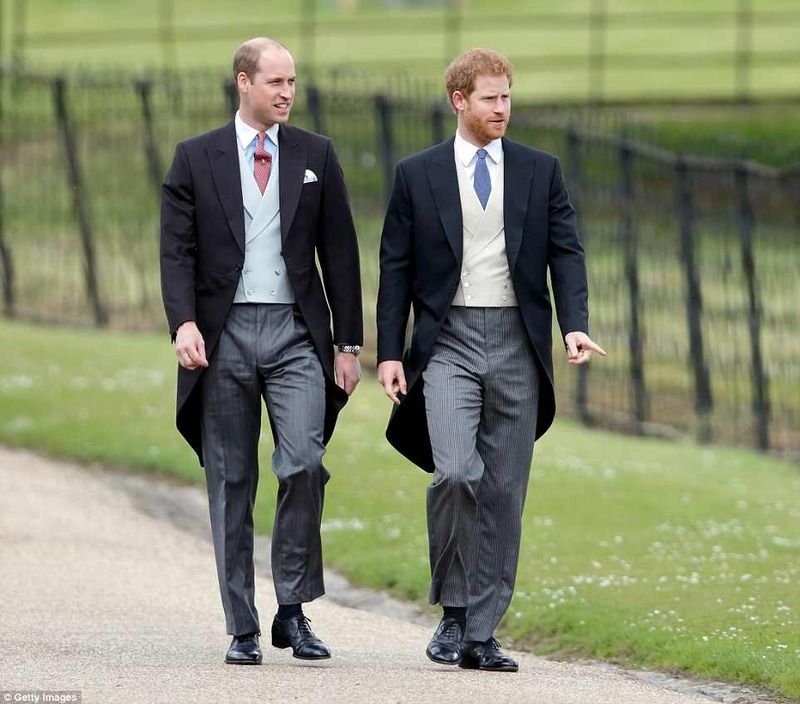 Prince Harry and his brother The Duke of Cambridge, who is his best man, will arrive at St George's Chapel most likely by foot and will enter via the West Steps. This will allow Their Royal Highnesses to acknowledge the 1,200 members of the public invited into the Castle precincts, including the 200 charity representatives gathered in the Horseshoe Cloister at the bottom of the steps. On the morning of the wedding, Meghan will get ready with her mother and girlfriends at a mystery location. Mother and daughter will be filmed leaving in their car together. Meghan and Doria will stop just before they get to the venue. Doria will then head on into the chapel through the entrance reserved for members of the royal family, while Meghan will be joined by some of her Bridesmaids and Page Boys before she continues her journey to the church, entering via the West Steps. Members of the congregation will file out of the church onto the grass to see the start of the Procession before walking to the reception at St George's Hall. All guests will be attending the reception at St George's Hall in Windsor Castle afterwards, which will last until around 3.30pm. Later the bride and groom will be photographed by media departing Windsor Castle for the evening reception at Frogmore House. There will be no US-style rehearsal dinner, although there will, clearly, be rehearsals. 'There will be plenty of chances for family and friends to catch up during the week before,' a spokesman said. A spokesman for the couple said: 'The bridesmaids and page boys are all children. Ms Markle will not have a maid of honour. She has a very close group of friends and didn't want to choose one over the other. A Kensington Palace spokesman said: 'On the day itself we expect Windsor to be very busy. The council has worked with partners including Thames Valley Police to plan what will be a fantastic day of celebrations. 'As the Royal Borough of Windsor has said, work is well underway to ensure the occasion is a memorable and joyous one for all involved and they are working closely with a wide range of partners. 'Rail operators will be putting on extra trains and there will be park and walk and park and float services (arriving by boat) to help people get into town. Visitors are encouraged to plan ahead and book all travel arrangements early so they can make the most of their trip. Concluding the briefing a spokesman for the couple added: 'We are now just over two weeks away from the wedding of His Royal Highness Prince Henry of Wales and Ms Meghan Markle. As they have travelled around the UK in the months since their engagement last November, Prince Harry and Ms Markle have been incredibly grateful for the support they have received from members of the public. 'The crowds that have turned out in Nottingham, Cardiff, Brixton, Edinburgh, Birmingham, Belfast, Bath and elsewhere have given Ms Markle a welcome to the United Kingdom marked by warmth, enthusiasm, and a real sense of fun. 'We said from the outset that Prince Harry and Ms Markle were keen to make sure that members of the public would have the opportunity to feel part of the celebrations on their wedding day. 'This is their way of expressing their gratitude for the messages of support they have received from around the UK, the Commonwealth, Ms Markle's home country of the United States, and right around the world. Buckingham Palace is hopeful Philip will be at the ceremony, but his attendance is not guaranteed.Prince Philip may not be well enough to attend Prince Harry and Meghan Markle's royal wedding, it emerged today. The Duke of Edinburgh is currently recuperating from a hip replacement and will likely be aided with a 'stylish stick or cane' if he does attend his grandson's big day. Royal staff will take guidance on whether he is well enough to attend the nuptials closer to the time, the aide added. The Duke of Edinburgh was admitted to the private King Edward VII Hospital in early April for surgery after a month of severe discomfort on the advice of doctors. It seems as if the 96-year-old, who is likely to still be using walking sticks or crutches at this stage, was keen not to be seen incapacitated so left ten days later after a prolonged rest. 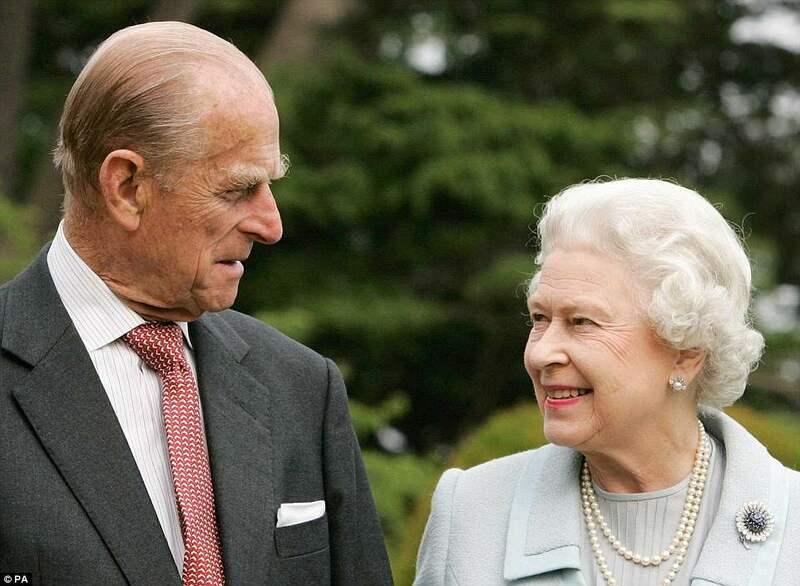 Buckingham Palace has said he will continue his recovery at Windsor Castle, where the Queen is in residence, and both the Queen and Princess Anne have said he is in 'good form'. The elderly royal will have already begun his rehabilitation moving with the aid of a stick or crutches, and will face weeks of physiotherapy as he learns to walk again on his new hip. For about a month before his operation the duke had complained about trouble with the joint but medical experts have said a few weeks after a hip replacement patients are usually back to their normal lifestyle, free from pain. Meghan Markle will not have a maid of honour - and the page boys and bridesmaids at her wedding to Prince Harry will all be children, it emerged today. Close friends of the former US actress include her stylist Jessica Mulroney, who runs a bridal store in Toronto and is said to have helped Meghan choose her gown. The glossy Canadian socialite, dubbed 'the Gwyneth Paltrow of Toronto', is a professional wedding planner and will have no doubt been passing on tips. 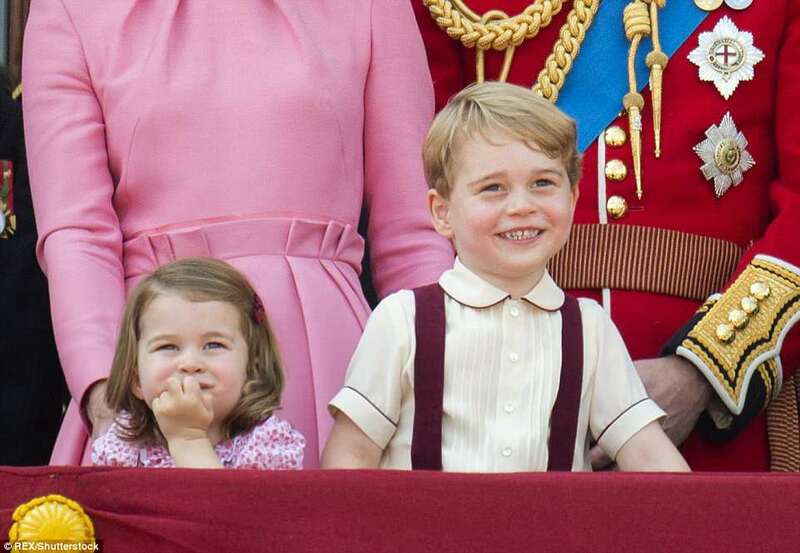 Meanwhile the Duke and Duchess of Cambridge's children Prince George and Princess Charlotte are expected to be among the children involved in the wedding. Meghan's close-knit group of confidantes have been helping her with the wedding preparations and will be with her in London in the run-up to May 19. Kensington Palace said the bride-to-be had such strong bonds with her friends, who have all been invited, that she could not pick just one as her maid of honour. Instead she has picked youngsters as bridesmaids and pageboys - with Prince George and Princess Charlotte certain to be among them. 'They have been actively involved in helping her prepare for the day and will be there with her the day before in London. She will be pleased to have their support on the day but they have no official role. 'Indian actress and philanthropist Priyanka Chopra will also have been a source of support for Meghan in the run up to the big day at Windsor Castle in Berkshire. Chopra has paid tribute to Ms Markle as a 'strong, free spirit' who 'found her prince, fell in love and in turn made a cynical world believe in fairy tales again'. The actress wrote a piece to accompany Meghan's entry in Time magazine's 100 most influential people of 2018, saying she would be a 'princess for the people'. Ms Markle is also close to tennis champion Serena Williams, after hitting it off immediately with her when they met at a celebrity flag football game in 2014. 'She quickly became a confidante I would text when I was travelling, the friend I would rally around for her tennis matches, and the down-to-earth chick I was able to grab lunch with just a couple weeks ago in Toronto,' she revealed. Other friends include her former Suits co-star Sarah Rafferty, actress and musician Janina Gavankar, New York socialite Olivia Palermo, former Suits and Mad Men actress Abigail Spencer, author Lindsay Jill Roth and celebrity pilates instructor Heather Dorak.Rafferty, who plays Donna Paulsen in the hit US legal drama, has been described by Meghan as 'not just my Suits sister wife, but my sister'. 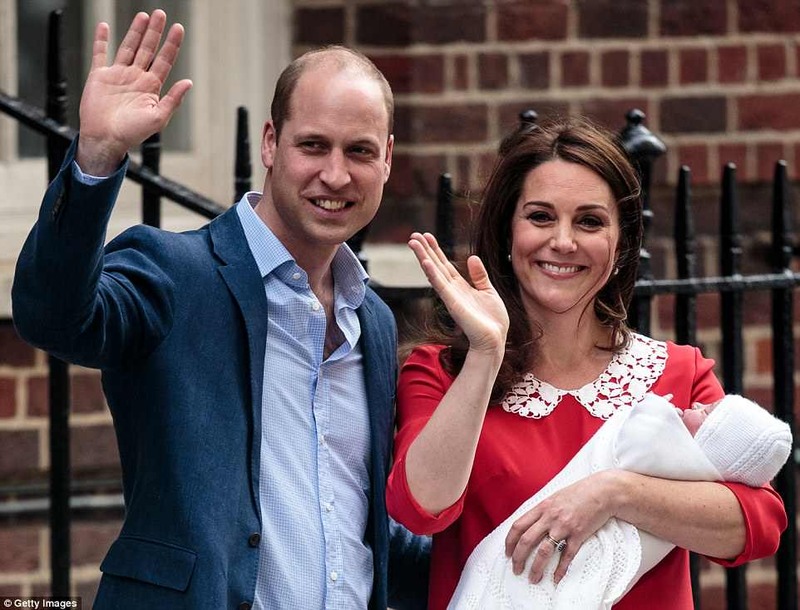 George and Charlotte gained a new brother last week, Prince Louis Arthur Charles, after their mother Kate gave birth at St Mary's Hospital in London on April 23. Kensington Palace made a host of announcements about the royal wedding today, including that Meghan's parents will meet the Queen ahead of the big day. Thomas Markle will walk his daughter down the aisle and Doria Ragland will accompany Meghan by car as she leaves for Windsor Castle, ready to marry Harry. Harry and Meghan will not be going on honeymoon straight away but will carry out their first engagement as a married couple the week after their wedding. The bride and groom will spend the night before the wedding apart and Harry's first glimpse of the dress will be as Meghan walks up the aisle. The couple also wanted to make sure the prince's late mother Diana, Princess of Wales, who was killed in a car crash in 1997, will be remembered on the day. Therefore Diana's three siblings - Earl Spencer, Lady Sarah McCorquodale and Lady Jane Fellowes - will all be present, with Lady Jane giving a reading. Prince Harry will make a poignant tribute to his late mother, Princess Diana, on his big day, it was revealed today. The Prince is determined to make sure Diana plays a significant part in the royal wedding as a way of 'celebrating the memory' of his mother, royal aides said. All three of Princess Diana 's siblings – Earl Spencer, Lady Jane Fellowes and Lady Sarah McCorquodale - will be present with their families and Lady Jane will give a reading during the service. In an official statement, Kensington Palace spokesman said: 'In addition to having the support of The Queen, his father The Prince of Wales, and his brother Prince William as Best Man, Prince Harry is also keen to involve his mother's family in his wedding. 'All three siblings of Diana, Princess of Wales will be in attendance and Lady Jane Fellowes will give the reading. Earl Spencer, 53, is best known for the blistering eulogy he gave at Diana's funeral. He and his wife Karen Gordon live at the family seat of Althorp House, where Diana is buried. Lady Sarah McCorquodale, 63, is the eldest of the Spencer children. She dated Prince Charles in 1977 and introduced the royal to her youngest sister. Lady Jane Fellowes, 61, is Diana's elder sister, who married Robert Fellowes, a former Private Secretary to the Queen. Earlier this week, former butler William French, who worked on the Royal Yacht, told in the ITV show Prince Harry's Story how Harry will remember his late mother on his big day. Prince Harry will not meet Meghan Markle 's father until a week before the wedding, it was revealed today. Thomas Markle, 73, is only jetting in to London from Rosarito, Mexico just a week before the couple walk down the aisle at St George's Chapel in the grounds of Windsor Castle on Saturday, May 19. Meeting the father-of-the bride is one of the most nerve-racking moments for any groom and Harry still hasn't done it despite his impending nuptials. But sources claim Meghan's father has already struck up a close friendship with Prince Harry and has spoken to him regularly to discuss the couple's wedding. Harry is also believed to have called Thomas at his home in Mexico to ask for his daughter's hand in marriage. Meghan's mother Doria, 61, has met Harry - at last year's Invictus Games in Toronto, when he said his future mother-in-law was an 'amazing' woman. The ex-Suits star's parents will also meet the Queen, the Duke of Edinburgh, Prince Charles, Camilla, as well as Kate and William for the first time in the week before the wedding. Mr Markle has clearly been preparing himself for the wedding and meeting his future British family. The 73-year-old was pictured carrying an AA-published book called Images of Britain: A Pictorial Journey Through History as he strolled through his hometown of Rosarito, Mexico last month. Mr Markle’s guidebook, first published in August 1990, is packed full of the most beautiful landscapes and buildings Britain has to offer. Less than 20 pages in, he will have found a photograph of his daughter’s wedding venue, Windsor Castle, looming over boats on the Thames. Mr Markle was a leading Hollywood lighting director in his mid-30s when he met Meghan's mother, Doria, who was 12 years his junior and temping in his studio. They married and a year later Meghan was born, in August 1981. Mr Markle divorced Doria, who went on to become a social worker, when their daughter was six. Meghan is closer to her mother and is reportedly not on good terms with her half-sister Samantha and half brother Thomas Markle Jnr, who was arrested for allegedly putting a gun to his girlfriend's head during a row last year. Royal fans across the country have been waiting with bated breath for the full details of Prince Harry and Meghan Markle's wedding day. And finally Kensington Palace have released the full schedule and timings for the big day. Here we look at what we can expect on May 19, from when the first guests arrive at Windsor Castle to the evening celebrations at Frogmore House. There will be no American-style maid of honour and all of the couple’s page boys and bridesmaids – who are expected to include Prince George and Princess Charlotte – will be children. Wedding guests arrive at the Castle's famous Round Tower by coach and enter the chapel through the South Door and take their seats. Possibly around this time Harry and his brother the Duke of Cambridge arrive at the Chapel's West Steps, probably on foot walking past the thousands of spectators invited into the grounds of the castle. The moment will give Harry the chance to acknowledge the 200 representatives from charities he is associated with gathered in the Horseshoe Cloister at the bottom of the steps.